50 years with a Sears 6344 telescope. Those are very nice 3” refractors Bob! I had a 6344 that I converted the focuser’s visual back to 1.25” and gave to my daughter along with a nice set of Plossls. The optics are very sharp. I hope you take it out and take a look through it before you put it back in the box. They are really nice double star scopes. I hope you take it out and take a look through it before you put it back in the box. I hope folks here don't mind me posting a pic of a non-classic scope but it does remind me of the old Unitrons which I couldn't afford back in the day. Clear skies and remember to keep looking up! Edited by BFaucett, 09 February 2019 - 05:59 PM. Oh the Christmas morning memories!  Thank you for sharing your beautiful scope. 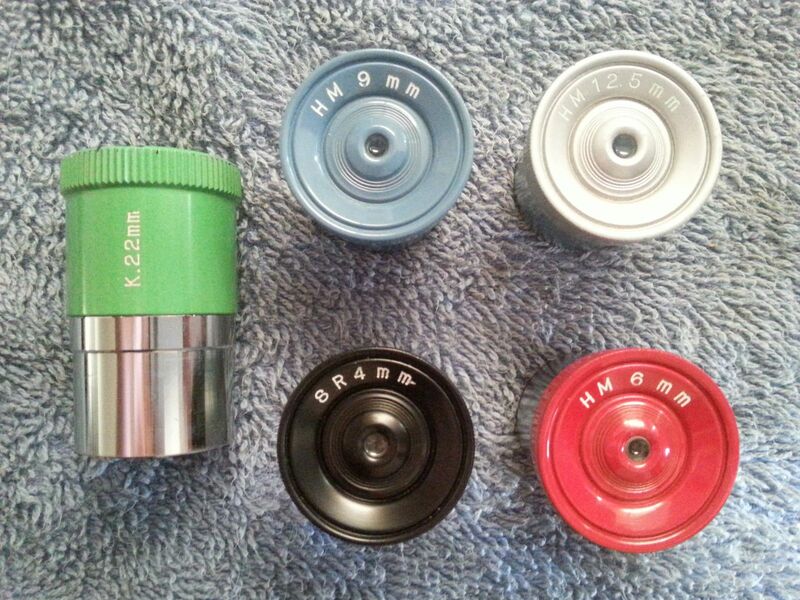 Can you post a closeup of the eyepieces it came with? I think it's fairly obvious why I mostly used the green one! Edited by BFaucett, 10 February 2019 - 03:00 PM. Congratulations on your 50th Anniversary with a truly beautiful telescope! Edited by KeithC, 10 February 2019 - 09:21 PM. Keith, since I found my 6344 a couple years ago (incomplete kit), I've been able to come up with both a yellow and green EP. Memories, memories! I bought the exact same scope the exact year, 1969, remember the ad also. Did not know what I had back then, or I would have kept it. 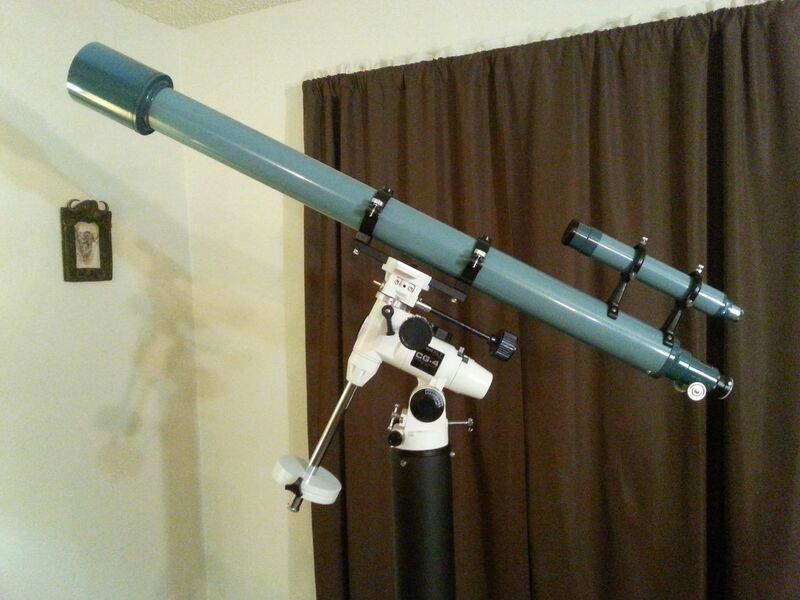 I have the same telescope. My serial number is #1746. My glass looks great, but my paint is a little scratched and the clamp on the mount broke years ago. Any idea of how to find a replacement? Nice scope and I was just 8 years old when my family got this for my dad and I. Cool! Another 6344 still in the hands of the original owner. 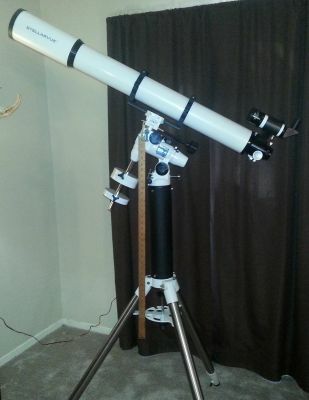 I have no idea how to find a replacement for the clamp but I bet the folks here on the Classic Telescopes forums might have some ideas. Thanks for sharing the photo! Post a wanted ad for the mount in the Classified Area for it. I bought one of these a couple years ago from a Goodwill auction. It was mostly complete, but was missing a few items and the clamshell was busted. I put up a wanted ad for it. 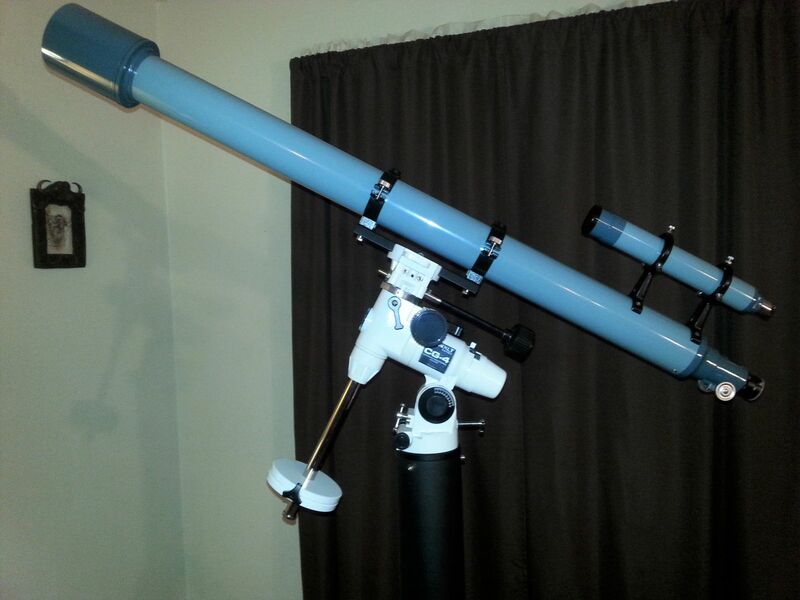 I ended up getting an Towa EQ3 on a Vixen SP wood tripod, which is a much improved platform to put the scope on. But, right after I bought the Towa setup, a good 6344 clamshell mount was posted on Classifieds. So there may be one or two out there for you. Beauty Classic Scope, looks like its been preserved in an underground climate controlled bunker. Just a little addendum and finale and I certainly didn't want to disappoint terra! I added new rings and a new dovetail bar. I also added the Vixen 36.4 mm to 31.7 mm adapter to the focuser tube so I can use modern 1.25" diagonals and eyepieces. I put this together this evening so I haven't had a chance to use it yet. Plus, the weather has been miserable for the past few weeks. BUT, the old telescope is ready to go and gaze at the stars once again! I'm looking forward to using the old telescope again after all these years. I'm a lousy photographer but I hope you enjoy the photos. 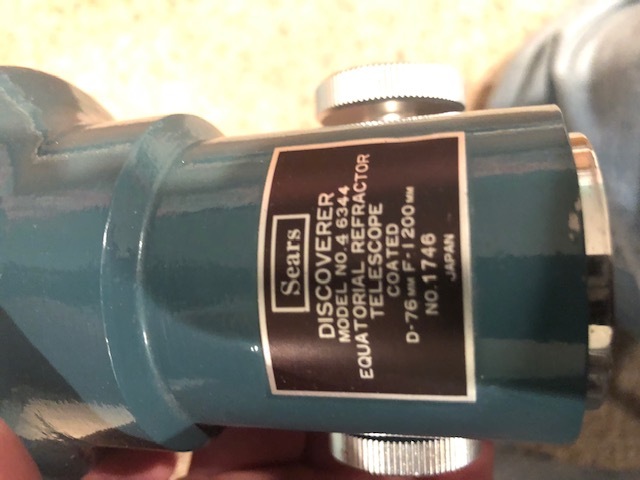 I am in the process of restoring an almost identical, but extremely well used Sears refractor I picked up at a Goodwill auction. I just hope I can get mine to look half as good as yours. Really and truly that is such a beautiful instrument! Does anyone happen to know what the colors are for the paint? 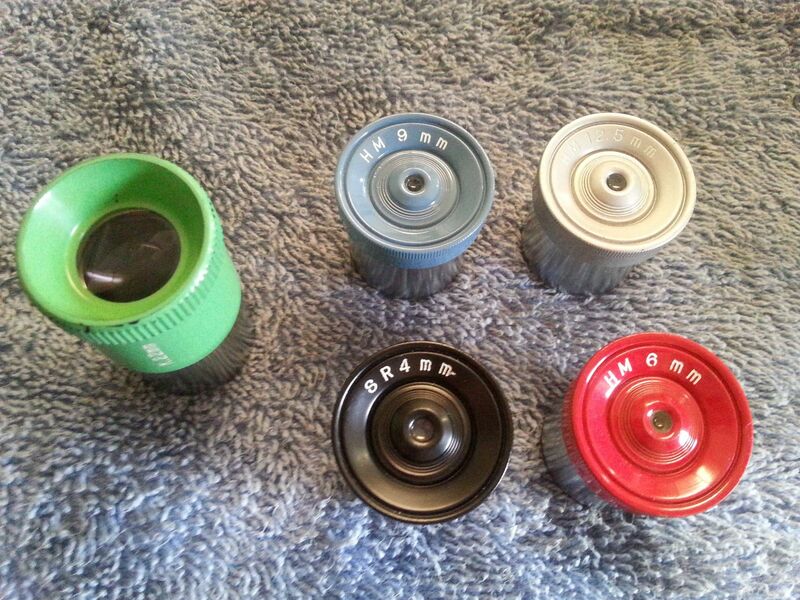 Mine has scratches on the tube and the dew shield and I would really like to match the colors as close as I can. 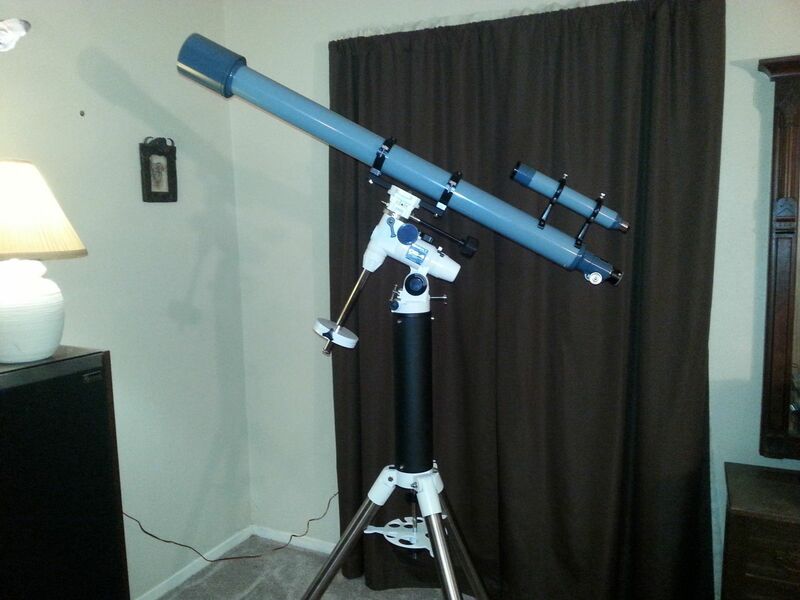 These 76mm refractors are one of my favorite instruments. At f/15.8, they have excellent color correction and are amazing performers. Way to go Bob, that's one heck of a classic! I also bought a well used 6344 (S/N 2321) about a month ago for a restoration project, the sun shield is mangled but the rest is pretty good, hoping to make nice functioning classic out of it for a collector.